So as im waiting for my bus right? I just happened to look uo at the sky and notice this abstractical radical piece of art & you all should kno me by now that i LOVE LOVE L-O-V-E to take pictures. So i did just that. 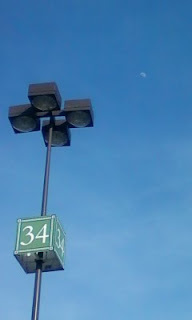 I like how the moon is faintly but oh so obvious floating in the back ground while the 34 lit parking signs stands there in the lime light haha. Yea i can turn anything into a story lol.